Amazingly, our flight was on time and made it into Vegas and our hotel rather early. (When does that ever happen?) We headed on the monorail down to MGM to get across the street to the Luxor because I wanted to see the exhibit on Titanic. The exhibit was cool to see because of all the artifacts that have been found but I really learned nothing new and like everything else in Vegas, it was vastly overpriced. Jean,(jeff's mom) and I ended up walking all the way back down to the strip to our hotel with stopping at a few places. Three blocks in Vegas is actually more like 3 miles. We ended up eating at a burger joint in our hotel(Harrahs). Friday was full of shopping. We started at Caesars and spent some quality time in H&M. I wish we had one here. We had lunch at a Cheesecake Factory for lunch and aside from some of the best ranch dressing I've ever had, it was pretty lackluster. I stopped at a Coach store but was promptly run out by overzealous sales people who were hungry for commission. Went to Tiffany's there but nobody was really willing to help me. I guess when you go into Tiffany's in capris and flipflops they don't see "sale." So I left disappointed that I hadn't got anything. We made up for it that afternoon when we visited the Tiffany's at the Bellagio and ended up making a necklace by choosing the chain and the charm I liked. 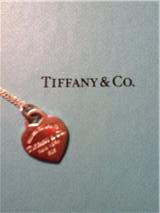 I've been getting Tiffany catalogs since before Avalon was born and finally got something! We hopscotched our way back to our hotel. We would stop to gamble every now and then but other than the very first evening when I came out about 20 dollars ahead, I lost. I quit when I was about 50 dollars down which is probably pennies compared to what most people gamble. I just like getting something for my money. Apparently I'm bad luck cause Jean didn't have much luck either. After dinner at our hotel's buffett, I went down to the Paris bymyself and went up the "Eiffel Tower" and got to watch the Bellagio's fountain show from up there. Saturday we spent the morning at the Venetian/Palazzo shopping. You'd catch me getting on a gondola in the canals just about at soon as you'd catch me at a singing restaurant on my birthday: never. 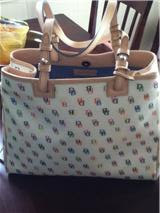 I did manage to get a new Dooney at the Venetian. And sadly, or fortunately, depending upon how you look at it, getting a new handbag totally made my day. And it was 50% off, how could things get any better? We headed over to the Fashion Mall and just hit a few stores because believe it or not, I was just about shopped out. But I hit up Janie and Jack(http://www.janieandjack.com/index.jsp) and The Children's Place for Avalon. If you've never been to or heard of Janie and Jack, you must go. Granted it's a little spendy but the clothes are so stinkin' cute! That afternoon we went to the Price is Right. Neither of us got up on stage but was entertaining all the same. I had a great time but other than maybe taking Jeff there to see some shows or getting a quick shopping fix, I probably don't need to go to Vegas again. In Vegas, I was really too busy to be missing Jeff and Avalon although one night, she asked me to come over to see her new dress that she and Jeff had gotten. Kind of broke my heart. But once I saw them at the airport, I realized how much I missed them. Also, it was different to be on vacation without them. Vegas is bigger than life in every respect right down to our amorous neighbors who kept me up all night. I'm glad I got to go but am so glad to be home! That stinks that the Cheesecake Factory wasn't very good. The one I went to at the Baltimore harbor was fantastic. I checked out Janie and Jacks... spendy is right but I may have to go there for some of those awesome little boy socks! I am with you on the Caesar's shopping not being as good as the Bellagio or the Venetian. Though I most certainly want to hit up H&M the next time I'm there. I'm not a huge Vegas fan, but I'm determined to have fun at least ONCE there at some point.